A new book argues that the Constitution’s framers believed that vast concentrations of wealth were the enemy of democracy—so what happened? “A constitution is not intended to embody a particular economic theory,” wrote Supreme Court Justice Oliver Wendell Holmes Jr. in 1905. Holmes was dissenting from the Court’s majority opinion in Lochner v. New York, which held that the New York State Legislature had violated the right to freedom of contract when it passed a law setting a maximum work week of 60 hours for bakery employees. In his dissent, Holmes insisted that there had been no violation: Because the Constitution was indifferent to economic matters, New York’s Legislature was free to regulate the state’s economy as it thought best, and it was not the Court’s job to second-guess it. Judges invoked “freedom of contract” to overturn many labor laws and other economic regulations between the 1880s and the 1930s. But three decades after Lochner, during the pitched political battles over the New Deal, the courts stepped aside and allowed state legislatures and Congress to pass sweeping regulatory laws: minimum wages, maximum hours, statutes for unionization and collective bargaining, and much more. Holmes’s lonely dissent proved prophetic and entered into the canon of constitutional writing, and it became a touchstone for progressives in particular. Ganesh Sitaraman’s new book, The Crisis of the Middle-Class Constitution, argues that Holmes’s famous dissent got it backward: The Constitution does “embody a particular economic theory,” just not that of free-market libertarianism. According to Sitaraman, who was a staffer in Senator Elizabeth Warren’s office and now teaches at Vanderbilt Law School, the Constitution was written and adopted with the understanding that the political system it established could only work in a fairly equal economy, with no vast concentration of wealth and power at the top, no wasteland of poverty and exploitation at the bottom, and a big mass of the “middling sort” of people at the center. Although the Constitution says very little about economic life, Sitaraman shows that plenty of people in the period of the nation’s founding believed that political power reliably followed the distribution of wealth. In nations where land and resources were concentrated among the few, political power was concentrated there too; in nations with a large middle class, power was more evenly distributed and democracy could thrive. This was why the American founders believed the United States could become a republic of self-governing citizens. Land was widely available, and most white men could find a place in the country’s economic life. For that reason, they could also find one in its political life. But if American wealth ever grew as concentrated as it was in England and other aristocratic societies, a republic would prove impossible: Welcome to the oligarchy. As Sitaraman acknowledges, his argument isn’t new; instead, he is trying to recover an American tradition as old as the country itself, one that gets revived whenever economic inequality becomes central to our politics. The main points of this tradition are familiar ground for students of constitutional history, but they are worth revisiting. After discussing figures like Thomas Jefferson, James Madison, and Daniel Webster, who argued that a broad distribution of property would keep the United States from becoming an oligarchy, Sitaraman hurries through the age of Andrew Jackson to the decades after the Civil War, when the country began to look as it does now. The 13th and 14th Amendments abolished slavery and established universal citizenship. The closing of the frontier brought the end of open land, and the rise of an industrial economy moved the basis of wealth increasingly from land to factories. Those factories produced enormous concentrations of wealth, and factory work meant that millions of citizens would never enter the Jeffersonian idyll of yeomanry and own their own land; America soon started to take the form of an oligarchic political system. The US Senate, whose members were appointed by state legislatures, was full of wealthy friends of the new monopolies. The Supreme Court, which heavily represented corporate interests, stood ready to strike down any law that interfered excessively with laissez-faire principles. William McKinley’s operatives raised millions of dollars from big corporations to help defeat the populist William Jennings Bryan. Adjusting for inflation, the country had become a billionaires’ republic. But Sitaraman is less interested in the rise of oligarchy in America than in the Progressive movement’s response to it. Teddy Roosevelt, New Republic founders Herbert Croly and Walter Lippmann, and other hard-hitting, high-minded realist reformers are the heroes of his story. Historians, especially those on the left, might qualify their heroism: Roosevelt became the avatar of a strident nationalism that ran parallel to his anti-monopolism, and the New Republic became the mouthpiece for Woodrow Wilson in the lead-up to the First World War. But they did create a vital alternative to the laissez-faire liberalism then dominant in the United States. To unwind oligarchy and restore something like democracy, politics had to be insulated from economic power. So the Progressives pursued an agenda that included campaign-finance reform, the direct election of senators (adopted via the 17th Amendment in 1913), and measures that allowed people to approve legislation directly at the polling place by means of voter initiatives and referendums. Judicial elections also appealed to the Progressives as a way of breaking the corporate grip on the courts. The goal was to restore political power to citizens, weakening the intermediary processes—-such as judicial and senatorial appointments—-where money snuck in. The Progressives also aimed to restructure the economy, trying to establish a more middle—class distribution of wealth and power. Their tools included antitrust law, to break up corporate conglomerates and give small producers and retailers the chance to thrive in competitive markets; a progressive income tax, to keep wealth from accumulating among the richest; and a place for unions and other sources of workers’ power, to counter the economic muscle of owners and bosses. In describing their bold ambitions, Sitaraman interprets these Progressives largely as they presented themselves: as reformers updating the ideal of a republican economy for the world of industrial capitalism. As Croly put it, they hoped to use Hamiltonian means to pursue Jeffersonian ends: A strong, interventionist state could help liberate individual citizens. In some ways, the New Deal deepened these Progressives’ successes; it also, in Sitaraman’s telling, introduced new elements into the mix that eventually diminished their vision. New federal bodies like the Securities and Exchange Commission, created in 1934, greatly strengthened political oversight of the economy. The Wagner Act, adopted in 1935, established the modern framework of labor law and helped unions achieve their strongest position in US history. World War II and the Korean War helped drive top marginal tax rates to now unthinkable levels: more than 90 percent in 1944–45 and again in 1951–63. With the passage of the Social Security Act of 1935 and expanded unemployment benefits, the country seemed to be on the way to what Franklin D. Roosevelt called “a more permanently safe order of things”—a middle-class democracy for the 20th century. But there was a snake in the garden. Actually, Sitaraman argues, it was a two-headed serpent. One head belonged to the businessmen who, after fiercely opposing FDR for nearly a decade, moved into the administration after 1941 to help administer the war economy, thrusting aside Roosevelt’s union allies and their vision of “industrial democracy.” After that, business leaders played an inside/outside game, cooperating with the New Deal order to their own advantage while also undermining it with changes like the 1947 Taft-Hartley Act, which weakened labor’s legal hand and cleared the path for long-term deunionization. The snake’s other head belonged to those Roosevelt advisers, such as Interior Secretary Harold Ickes, who gave up on structural reforms that redistributed economic power. They retooled the New Deal’s egalitarianism into policies that promoted consumer welfare: If the US economy kept growing and everyone’s purchasing power increased, then Roosevelt’s “permanently safe order of things” could go on without messy distractions like labor conflicts or antitrust assaults on corporate power. Economic experts and public-minded corporate chieftains, instead of unions and workers, would be trusted to keep the engines of prosperity humming. For a while, it seemed to work. Organized labor became a pillar of civic life, building community halls and donating financial support to events like the 1963 March on Washington for Jobs and Freedom and the first Earth Day in 1970. Americans experienced what economists call the “Great Compression,” a period of unusual equality in wealth and income that lasted until the 1970s. Union members entered the middle class and moved to the suburbs. But there were fault lines in the New Deal order. The New Deal had ratified the continued subordination of African Americans in economic and political life, and as the civil-rights movement challenged American apartheid, Southern Democratic voters defected to the Republicans, who blended racial reaction with libertarian economics. New social movements, especially second-wave feminism and the defense of abortion rights, fractured the American center-left along cultural and class lines. Liberal reformers also thought less about the middle class, which seemed to be taking care of itself, and more about those who were excluded or left behind, especially black Americans and Appalachian whites. The problem had shifted from one of unequal power and wealth in general to one of inclusion: The system worked, or so its liberal elites thought, and the problem was to get everyone into it. Sitaraman acknowledges that it wasn’t always this simple: Many civil-rights leaders, such as Bayard Rustin and Martin Luther King Jr., understood that black liberation would require a second economic Reconstruction if it were to produce an egalitarian society out of a deeply unequal one. Lyndon Johnson’s War on Poverty may not have been a Progressive-style wrestling with the structure of the national economy, but it was a bid to extend a “permanently safe order of things” to those who had never had it. This was the repair work required by the New Deal, which, held hostage by racist Southern Democrats, had carved most black workers out of its protections (and set up the later exploitation of Latinos and other immigrants, who moved increasingly into agricultural and domestic labor, originally the province of black workers). So while the New Deal made democracy possible in the 20th century, its achievement of moderate economic equality was always tenuous. It relied on the support of business interests that undercut its labor wing from the start and turned much more aggressively against regulation and taxes after the early 1970s. Its electoral coalition depended on making peace with Jim Crow segregation and didn’t survive its end, let alone the cultural fights of the 1960s and ’70s. By the time Jimmy Carter was elected in 1976, the Democrats’ 40-year coalition was in tatters, and beyond the drama of American politics, a widening gulf of economic inequality was beginning to reshape much of the North Atlantic. Here Sitaraman’s story intersects with the one that Thomas Piketty made famous with his 2013 book Capital in the Twenty-First Century. The new world of widely shared growth turned out to be anomalous and fleeting nearly everywhere. The American transition from postwar egalitarianism to the New Gilded Age was an especially vivid instance of a general pattern. Between World War II and the mid-1970s, US productivity and blue-collar wages grew at nearly the same rate. After the mid-1970s, productivity continued to increase, albeit more slowly, but almost all of the gains went to high-income earners and the owners of capital. Inequality returned, and it grew and grew and grew. The share of national income going to the top 1 percent of earners, which fell below 10 percent from the 1950s into the ’80s, has recently pressed close to 20 percent—about where it was before the Great Depression. The New Deal was undercut by both its own political vulnerability and tectonic shifts in global economic life. Franklin Roosevelt and his allies had built, at best, only a partially and ephemerally safe order of things. For Sitaraman, these developments show that the founders’ republican vision, as updated by the Progressives, was right all along: Unequal economic power is the enemy of political democracy, and the only way to make democracy real is to work against inequality on both the political and economic fronts. To make that recommendation concrete, Sitaraman proposes a policy program to set the country on the right track. He urges stronger antitrust law, aggressive financial regulation, and reforms to reward long-term corporate investment rather than quick profit-taking, as well as progressive taxation, higher wages, more spending on education, and a commitment to net neutrality. He supports campaign-finance reform but notes that it won’t be enough; money will always shape politics, so the distribution of wealth must not be too unequal in the first place. He would also welcome a stronger labor movement but, like most friends of labor, sees little cause for optimism. Sitaraman doesn’t claim that all of this reform would unfailingly restore a “middle—class Constitution” to America, only that it marks out a better path forward than the two-step of Republican assaults on government and the Democrats’ cautious, technocratic ripostes. Yet he also avoids the more radical conclusions that his book invites. He brings economic class squarely back into thinking about the Constitution, but he hopes finally to dissolve it into a transpartisan “wisdom of the wisest patriots,” as Madison, who fiercely opposed debt relief for poor farmers, put it. Class struggle, Sitaraman warns, can turn into “political or military conflict,” with “the poor seeking to confiscate and redistribute the wealth of the rich,” and he hopes instead for an alliance between liberal populists and “true conservatives” who, in the tradition of Edmund Burke, are willing to make the necessary reforms “to preserve our republican form of government.” He contrasts this conciliatory approach to constitutionalism with the “class warfare” approach, which he says he opposes. In fact, reading Sitaraman’s historical account, one often finds more value in class-warfare constitutionalism than his republican perorations against it would seem to allow. He has warm words for the radical redistributionist Thaddeus Stevens, who proposed breaking up the largest 10 percent of Southern plantations, distributing some of the land among freedmen and auctioning off the rest. This smashing-up of an oligarchic economy and the liquidation of its top class is surely “the poor seeking to confiscate and redistribute the wealth of the rich,” albeit through the intermediary of the Union Army. Sitaraman also admires the Knights of Labor, whose “co-operative commonwealth” would have put workers in charge of their own enterprises at every level, and whose politics were far more radical than anything the Warren (or San-ders) wing of the Democratic Party suggests today. 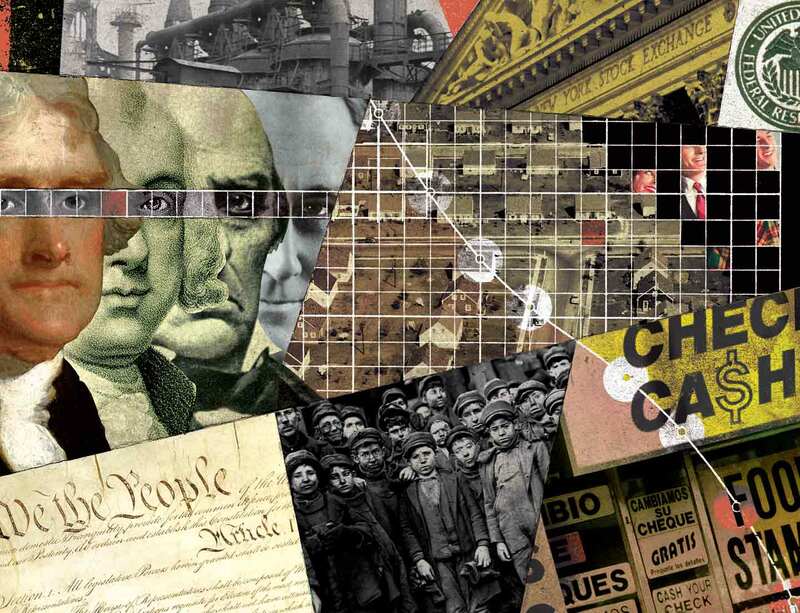 Sitaraman doesn’t conceal the fact that his favorite moments of middle-class political economy—the Progressive Era and the New Deal—emerged not just from high-minded reflections on republicanism, but from bloody class struggles in mines and factories. But he nonetheless seems to shy away from the lessons that they may suggest: Those who believed in and practiced class struggle have brought about each successive version of the American middle class, while those who believed that the resulting middle class was secure and permanent have lost their gains to complacency and the rapacious rich. Today, the cross-cutting fractures of class and race, from police violence to the rise of an increasingly female and nonwhite working class, make it less likely that a unifying image of the public interest could resemble those older ones, with their convenient homogeneity. But such myths are nothing to mourn. New forms of solidarity, ones born out of conflict as much as agreement, are on the horizon and are as essential now as they have ever been. They may not conform to older republican ideals, but they will nonetheless be in pursuit of a more egalitarian society.